I’ve been meaning to write something about the beef Rib section for some time now. Lucky you … today’s the day. The beef carcass has 13 rib bones per side, and the front quarter includes 11 of them. The Chuck has 4 bones, which leaves 7 for the Rib section. I’m often asked the difference between a Rib roast, a Standing Rib roast and a Prime Rib roast. Truth is … they’re all exactly the same cut with the only ‘real’ difference being the “Prime” designation refers to restaurant quality. Valentine’s day has come and gone for another year and I know many of you like to take your significant other out for a nice 5 star meal at a fancy-schmancy restaurant and for me, nothing beats a Rib steak. The Rib eye is the same steak, just without the bone. Chef Jeff Parker, a fellow I have mad respect for, has written a great Rib eye post on his Blog, and it ties very nicely into what I wanted to say re: the Rib section so, today with his kind permission I present his post, re-blogged on my site. Please click “follow” at the top of the page (Carnivore Confidential) and you’ll get an email notice every time I write something new. 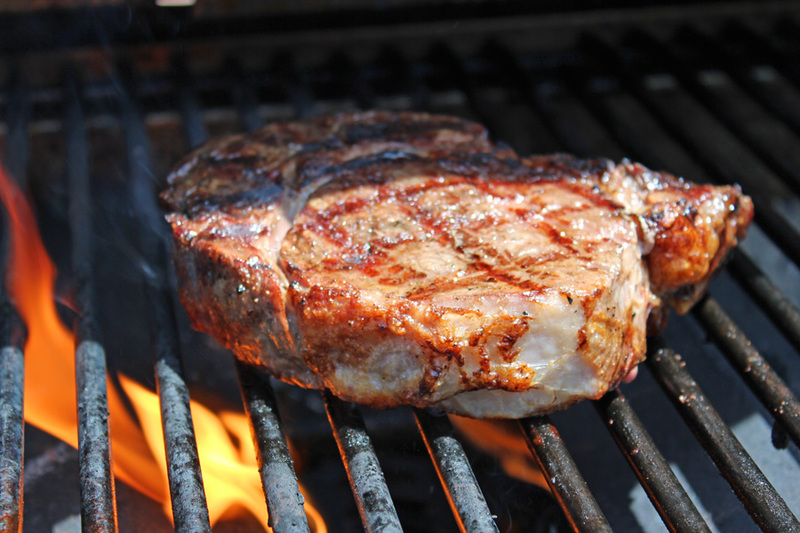 Rib eye is hands-down my favorite steak and a great one for the grill. The marbling in a rib eye makes it juicy delicious and pretty hard to overcook – at least from a dried out point-of view. Personally, I think it is at it’s best when cooked to the rare-side of medium rare, however is still juicy and delicious when cooked to medium+. You’ll have to keep an eye (pun intended) on them to watch for flare-ups – a small sacrifice for all that well-marbled flavor! If flare-ups do occur, simply move them over to a cooler part of the grill. This entry was posted in BBQ, Beef and tagged prime rib roast, Rib Eye, Rib eye Steak, Rib roast, Rib Steak, Standing Rib roast. Bookmark the permalink. The call of the wild … it’s all about the game. Fabulous post. Thanks. A standing rib roast that hasn’t had a butcher tamper (that is, remove the fat) with it is one of earth’s delights. Thank you !!! Stay hungry my friend !!! My pleasure Chef Jeff ! !